This week's episode was just one of those.. "meh" episodes. Nothing too much to talk about since not much happened, or nothing of interest happened is a better way to put it. We're at the point where Chinatsu and Tatara are working out the knots and kinks in their dance companionship. Working a part-time job, Tatara finds himself serving at a restaurant where Chinatsu's former dance partner, Akira, resides in. Chinatsu casually drops into the restaurant, and the former dance partners face off and spar over the Misaka Cup. You can smell the vitriol that spews out of Chinatsu and Akira as they share their thoughts to one another. Chinatsu leaves after the bitter exchange, and to Tatara's surprise, declaring that the two are now dance partners and are going to square off with Akira at the Misaka Cup. Initially I was in giddy that Tatara was now partnered up, but the aftertaste left a weird tingle after thinking about it more. 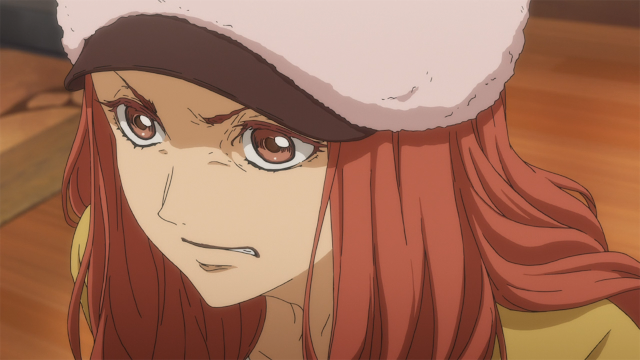 I felt a bit unfulfilled that the reason Tatara and Chinatsu formed a partnership was because of the vituperative nature between Chinatsu and Akira's distaste for each other. I hope the two will hold a long-lasting partnership, and Chinatsu doesn't drop him like a rock if Akira decides to not pursue dance/ the Mikasa Cup anymore. This partnership seems more like it's being held together by Chinatsu's bitter affinity towards her ex-partner. 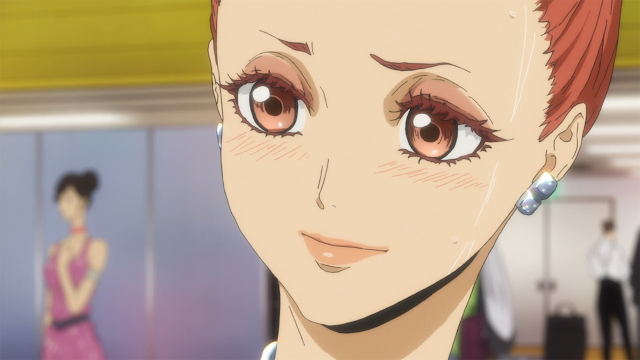 Though I hope I'm wrong, and that Chinatsu eventually ends up wanting to be with Tatara for the long run because she obviously loves ballroom dancing based on her initial stubbornness of not wanting to get rid of her dance equipment. Just from the outside looking in, Chinatsu is the perfect partner for Tatara. 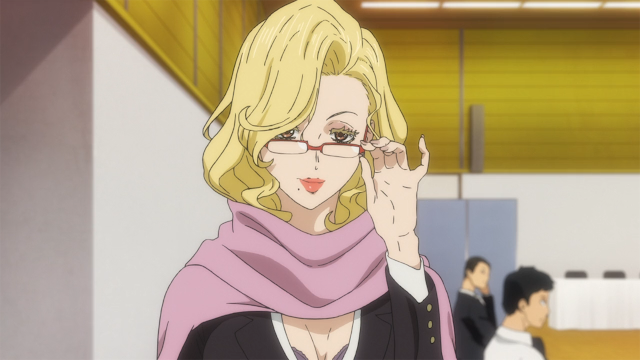 She's experienced in leading, which is something that Tatara has been doing incorrectly this whole time, and she's in a position herself where she's going to have to learn how to follow, much like how Tatara needs to learn how to properly lead. It's sort of like two inexperienced, yet not really inexperienced, dancers coming together; they have enough skills on the table to make lemonade out of lemons but they're still figuring how to do so. Does that make sense? lol. They're a match made in heaven in simpler terms. 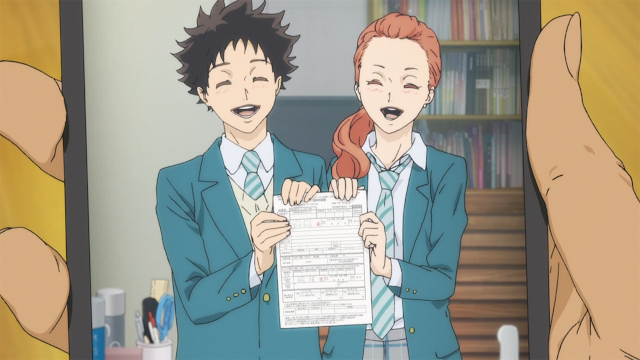 Right after Tatara and Chinatsu formed their new dance partnership, we dive right into a competition where Chinatsu and Tatara complete to rise up in the "dance rankings" so that they can reach a tier where they can enter legit competitions. The two were a hot mess from the two heats that they were in, yet they somehow placed second in the novice level and were able to rank up to "D," which means they can enter legit cups. A leader who's better at following, and a follower who's more experienced leading sounds like a terrible match, and it showed as Tatara and Chinatsu struggled to keep the optics of their routines believable. Chinatsu's going to need to find a way to let go of her control, and Tatara needs to find a way to get in control - they won't be able to keep up this smoke and mirror show for long, surely not long enough if Tatara wants to properly lead and Chinatsu properly following as partners. But something tells me that it won't take too long from them to get in control of proper leading and following, I mean Tatara's suppose to be a good leaner, and Chinatsu already a talented dancer.. right? But we'll see what the fate of their newly formed partnership brings, and if Marisa is going to play a big role in the last few episodes. The next episode looks really good.